The SpringWalker™ prototype could be greatly enhanced by the addition of servomotors to increase the motion generated by the user's foot extention. With a leverage ratio of approximately 2:1, the prototype's leg presently extends about half as much as that of the user. By incorporating an appropriate servo-assist system, the leg's extention could be greatly increased: For example, its extention could be twice that of the user's own leg (instead of half), and so could reduce the user's workload by a factor of 4! 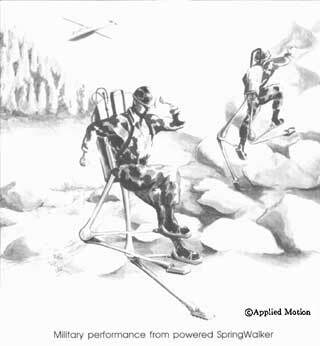 Even more importantly, the athletic capability of the user and SpringWalker™ together would dramatically increase; with twice the force (due to leverage) together with twice the extention (due to servo-assist) as that of the user's own legs. With a Li-Ion battery pack, the Servo-powered SpringWalker™ could lope up a mountain slope like an ATV for more than half an hour without recharging!